How to Use 8.5X11 Magnets for Fixing Blind spots in Marketing? Custom 8.5 x 11 magnets are large and offer a great advantage in the form of the big print area. Marketers can use them for fixing blind spots in their marketing strategy. Every business devises its own form of marketing to build leads and improve revenues. The one form of marketing, which worked for a business, may not work for the other. This blog aggregates information about various marketing blind spots noticed over wide industry segments. Inability to connect with consumers at the right time accounts for severe business losses. Many marketers are yet to understand it. They think word-of-mouth marketing will work for them and always bring them easy leads. However, it is partly true, but they need to ensure that people find their business information at easy-to-find places. They can easily do it with magnet advertising by indulging large sized personalized magnets 8.5 x 11 to position their brand at easy-to-find places over consumer’s refrigerator door and car doors. 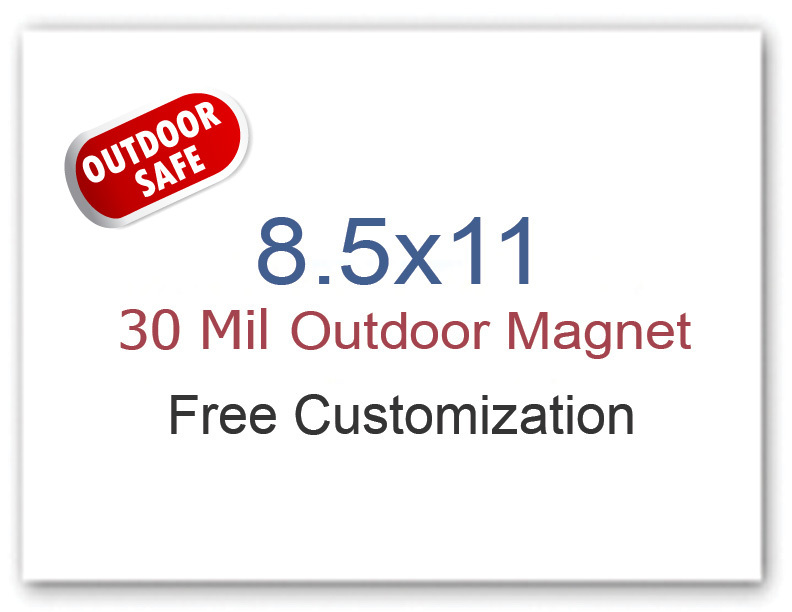 Many reputed online magnet stores stock these big-sized custom magnets in 20 MIL, 25 MIL, and 30 MIL, thereby allowing marketers to select at their own will. Fractured consumer experiences are the real conversion killers for businesses. Even in this age of digital marketing and improved traditional marketing, marketers lag behind in mapping consumer’s experiences and reactions. They should try harder to enrich the consumer experience by offering them information, which they would absolutely love. Customized 8.5 x11 magnets allow marketers to devise and develop marketing strategies, which enrich consumer experiences. Imagine the situation – You are an ice cream seller selling ice cream in different exotic, weird, fruity flavors and you have been trying to attract customers with varying tastes. You are treating your customers by appeasing their stubborn tastebuds. You can exactly devise the same marketing strategy for positioning your products. You should concentrate on delivering values rather than products or services. Use large 11×8.5 magnets for sharing news that delivers values such as “Enjoy longevity and energy by investing in pro-XYZ pills” or “Contribute to the society by purchasing environment-friendly XYZ plastic pouches”. Does that sound fair enough? Do you know why many marketing strategies fail to make a mark? Because they sound more mechanical and less human! They are always begging, bugging, and hammering consumer to buy, buy, and invest. Use large 8.5 x 11 magnets for creating an engaging content with a human touch. You can use it for displaying the human side of your brand. Local businesses, which wish to contribute to the community and society can seize these large promotional magnets for showing their support for the cause. Apart from refrigerator magnets, marketers can also invest in customized 8.5 x 11 outdoor magnets because they are large and easily visible from short distances. Avail benefits of free full color printing, free art set up, free online design proof, and free full color printing by ordering these customized magnets from an eCommerce made in USA magnet store.